Use this calculator to quickly calculate the actual flow rate through the orifice plate flow meter with only a few inputs. This calculator performs the flow rate calculation from the measured pressure drop caused by the orifice plate inserted in the pipeline. When is this calculator relevant? The calculator is suitable for liquids and perfect gases, a subsonic flow of single phase fluid. It is not applicable for pulsating flow. The pipeline should be circular. The calculator is not applicable for rectangle pipes. This calculator is not suitable for multiphase fluids, like a flow of liquids that contain solid particles or flow of liquids that contain undissolved gases. Also, it is not suitable for gases that are not ideal, i.e., gases that don't relate to the ideal gas law. To calculate flow rate, you have to enter the orifice plate throat diameter as well as pipe interior diameter, together with fluid properties - density and viscosity. For a gas as flowing fluid, instead of the density, you can enter gas constant, pressure and temperature at actual conditions. Density is then calculated using a perfect gas state equation. You should enter density on real flow conditions - pressure and temperature. The calculator is doing calculation according to ISO 5167-2. You can expect to have correct and reliable results only if the orifice plate meets the conditions from the standard. What are the standard ISO 5137-2 conditions? For the flow of a perfect gas, the pressure loss created by the orifice must be higher than 0.75. 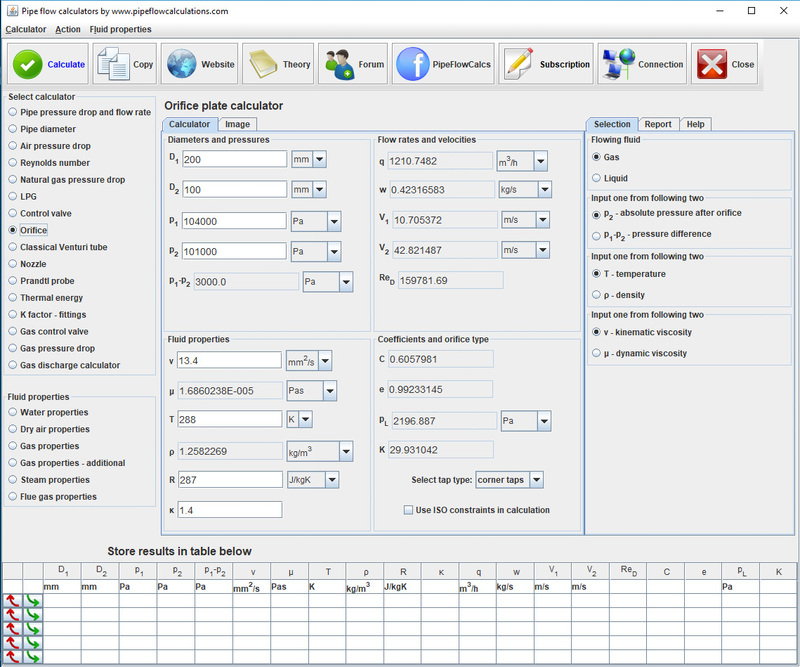 If the orifice plate properties or flow conditions are not according to the ISO 5167-2 calculator displays the message. If you want to do calculation regardless of the limitations in the standard, you can choose not to use ISO constraints in the calculation.